I have a LOT of food blogger friends. Not just friends that you write to on facebook and blogs, but friends that you wish you could hang out with if they lived closer. One of those friends is Monica Mooney, whom I fondly refer to as Moondoggie. She has the food blog, Sweet Heat Chefs, and I think she is wonderful. We belong to a food group where we talk and laugh and cry and talk about all kinds of personal stuff with no judgment, stuff we can talk about such as our blogging, or how do we get more followers or how do you like this recipe or my kid got an award today. I can’t wait for the day when we can all get together and share a meal and a big bottle of something!! These friends mean a lot to me, like a pen pal but in a group and way better! So, Chris ( or as I fondly call her Pickles~ yes I fondly have nicknames for the friend’s I love) from Foodthoughtsofawannabechef Blog came up with a brilliant idea to have a food ingredient swap, a secret swap with our Foodie Group. We all chose an ingredient from our local area and were given a secret friend to send the ingredient to. Monica was given me as her secret swapper…..lucky me!!!…. and she sent me a wonderful Zesty Garlic Seasoning, For Cooking and Dips, All Natural, no salt or sugars, from Bittersweet Herb Farm. Ingredients are parsley, garlic, chives, onion, lemon peel, herbs, and spices. Well, I was thrilled that Monica was my secret pal, she sent it to me in the greatest card, I swear the card burst open with the sunshine that she sent me, it was raining that day in Maine by the way, but not after that! Inside she wrote how excited she was that I was her secret pal, see what I mean?? I am crazy about Moondog, she is a wonderful person, she can make me spit my coffee all over my computer screen in a split second with her witty comments, I know she will have words of wisdom to bestow upon me or just a great joke! So I have been wanting to make these amazing, drool-worthy, Parmesan Crusted Potatoes that I saw on my friend’s facebook page. 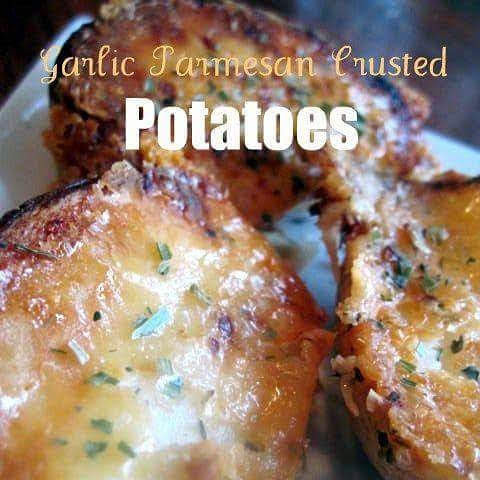 Ann, from The Fountain Ave Kitchen’s blog, is a fabulous cook and every time I see these potatoes posted on facebook, I say I really want to try them, they looked simple to make and really delicious. Well, guess what?? They really are, plus I sprinkled the Zesty Garlic Seasoning over the cheese before I placed the potatoes face down to bake. OOOOh! You are going to love this recipe. See what happens when you have such great friends? Great recipes are made!! Thank you Moondog for my Zesty Garlic Seasoning gift and thank you, Ann, for always having such amazing recipes, you know how I love the easy ones!! Thank you Pickles for coming up with another fantastic idea!! Zesty and flavorful garlic parmesan crusted potatoes are the best side dish! 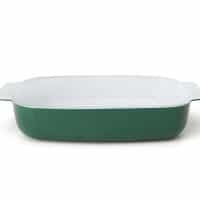 Coat the bottom of a 13×9-baking dish with the olive oil, and then evenly distribute the grated Parmesan over the olive oil. Sprinkle Zesty Garlic Seasoning over the cheese. Sprinkle with the salt and pepper. Cool for five minutes before serving. Remove to a platter with a metal spatula, and garnish with snipped chives, if desired. Leftovers are equally delicious reheated in the oven or eaten cold, my son will attest to this! 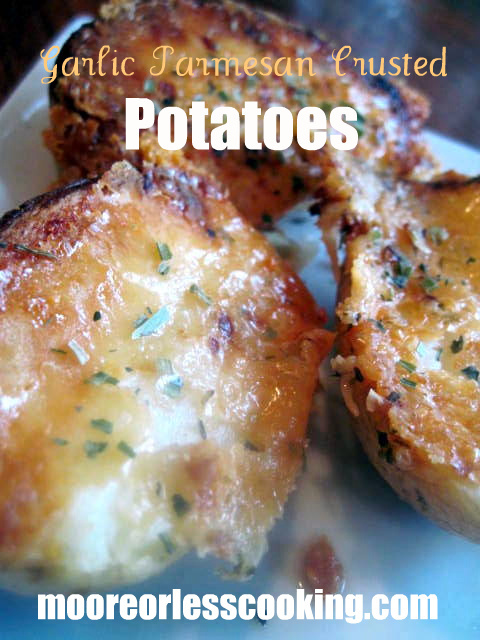 More Potato Recipes that you will love! Wow, that sounds so much like the Secret Subject Swap I’ve been running for 7 months. Looks like you had a lot of fun. I’m a big fan of Monica’s too! Yum! This looks so delicious! 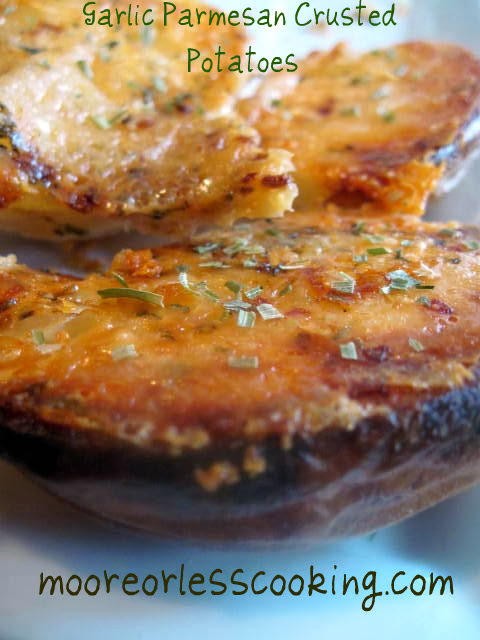 Garlic … Cheese … Potatoes … Heaven 🙂 Pinning! You have to try this recipe Zoe, you and your family will love them!! I want to make these but have never heard of zesty garlic seasoning could i just use garlic powder?? Yes, that would work great! 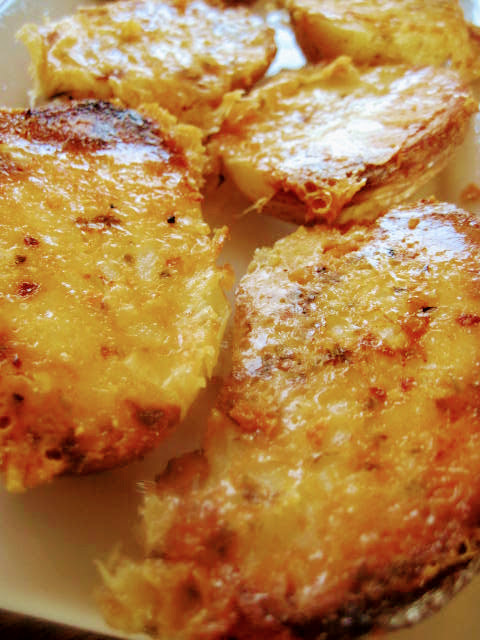 These potatoes are so yummy, my kids are asking me to make them again tonight! I have made a very similar potato for years. They are called Half-Baked. You grease a sheet with crisco and use melted butter to “paint” on potato half. Shake parmesan and smoked paprika on the painted spud. Cut side down in 375° oven for 30 minutes. Delicious in “half” the time as a baked potato! That sounds wonderful Katfromky, thanks for sharing with me! 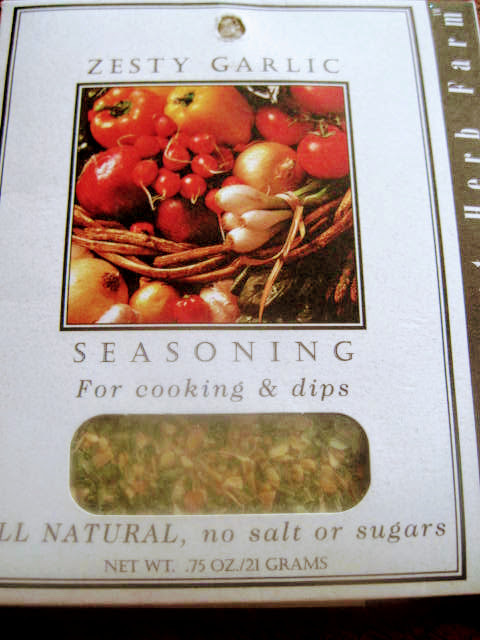 What is Zesty Garlic Seasoning and where do I get it? I started blogging my favorite recipes and then all of the recipes I wanted to try. It is from Bittersweet Herb Farm, Ingredients are: Parsley, garlic, chives, onion, lemon peel, paprika, herbs and spices. These sound yummy. Definitely adding these to next weeks menu. Thanks for sharing the recipe. And Happy New Year! We love potatoes around here! These will be a hit for sure! It is from Bittersweet Herb Farm, Ingredients are: Parsley, garlic, chives, onion, lemon peel, paprika, herbs and spices. Thank you for linking up with Foodie Friends Friday! Hope to see you next week! great party Lois! Thank you! OH MY, this looks incredible, I can see why it is your favorite post, would be mine too!! Yeppers these babies have been one of my faves for awhile also!! They are totally awesome!! Pinned and shared on FB and will be sharing on Google+!! Wow those look good… and I just finished eating dinner! That Zesty Garlic Seasoning sounds delicious… I can think of lots of recipes where that would be just the right addition! Great idea to put the oil and herbs down and put the potatoes on top… yum! I am absolutely drooling over these potatoes Nettie and I know my family will gobble them up in no time! Loving these potatoes Nettie! I know my family would gobble these up in a flash! Where did you get the Zesty Garlic Seasoning? What is /4 seasoned salt and /4 black pepper?? That is what is showing in the instructions on how to make. Is it suppose to be 1/4 ? They look delicious!